Electric black taxis have hit London's roads under plans to improve air quality but critics say their cost will put drivers off "going green". 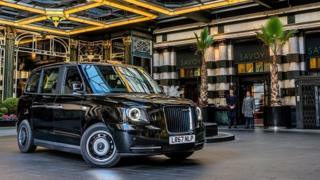 Chris Gubbey, boss of manufacturer the London Electric Vehicle Company (LEVC) insists the cab will "play a major role in helping to improve air quality". More than 9,000 such taxis, roughly half the current black cab fleet, are expected on London's roads by 2021. The vehicle's filtration system also removes harmful gases from incoming air. I took a ride in the new hybrid-taxi this morning - and it is certainly impressive. In full-electric mode it is whisperingly quiet. So much so that you realise just how noisy the rest of the traffic really is. From a passenger's point of view, the peaceful ride is really rather pleasant. On a cold December morning in London, when you can smell and taste the thick diesel fumes hanging in the air, it's easy to see the logic behind the new design. It offers a partial remedy to urban pollution, not just in London, but in other cities around the world - including those in China, where the financial backing for the London EV Company comes from. I'd like to say what the ride is like at speed, but I spend my entire journey stuck in slow-moving traffic. A problem the new design won't solve. I also spoke to a few cabbies who were plying their trade in the surrounding streets using old-fashioned diesel cabs. It's fair to say they were pretty sceptical. They were worried about how long the batteries would last, where they'd be able to charge them, and how they would pay for the new £55,000 design. An £18m scheme to install 75 rapid charging stations by the end of this year - which can load vehicles in 30 minutes - is reportedly behind schedule. "The whole thing is just a farce, you couldn't make it up," says Steve McNamara, General Secretary of the Licensed Taxi Drivers Association. He added: "We're constantly being told about technology and innovation, but they can't even put a few chargers on the street so what chance have we got?" Mayor Sadiq Khan said the rate of delivery for electric charging stations is expected "to rise dramatically, with over 130 locations currently being worked on."